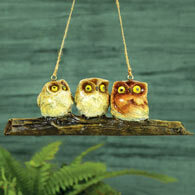 Bring permanent beauty to your yard or garden with these gorgeous birds. Place in view of your window and delight guests and family with their realism. Easily mounts to any tree with your nail or screw by using the metal keyhole on the end of the branch. Measures 6-1/2" x 5" x 2".